Gerald was born in Southampton on 23 March 1894 the son of Harry Morton Stamford and his wife Eveleen Beatrice Laura née Image. The family was well to do, his father living on investments having inherited wealth. One source of this wealth was Gerald’s grandfather Colonel Henry Stamford, Bombay Horse Artillery. Gerald had one sibling, but he/she did not survive infancy so he was, in effect, an only child. He was educated at a preparatory school in Sussex Square, Brighton, before moving on to nearby Lancing College, where he spent six years from 1906 to 1912. During this period his parents moved to Newbury, living at The Limes in Andover Road, probably in 1911 when local estate agents, Neates, where advertising its sale. The Limes was a substantial house that later became a hotel and then bedsits before being demolished to make way for a housing development. Bartlemy Road runs through the garden to its junction with Andover Road. Very shortly after he left school on 27 August 1912 his father died in Boulogne, France. Gerald’s uncles Cecil and Edmund Image were the executors of his father’s estate, which included ‘effects’ to the value of £5788 12s 11d. This was a considerable sum in 1912 – an online inflation calculator puts the value today at £608,800; such calculators are only an estimate, in terms of house prices or wages that sum in 1912 would probably be worth £3 million or more today. Following his father’s death, Gerald’s mother moved to a newly built house in Catherine Road, Newbury, which she named Oakleigh. Gerald found employment in the fruit growing business at Rudgewick, near Horsham, West Sussex. A lad of his means was probably not working as a farm labourer, nor was a lad of his age likely to own a fruit farm, it is most likely that he was learning the craft as an assistant to an established farmer. 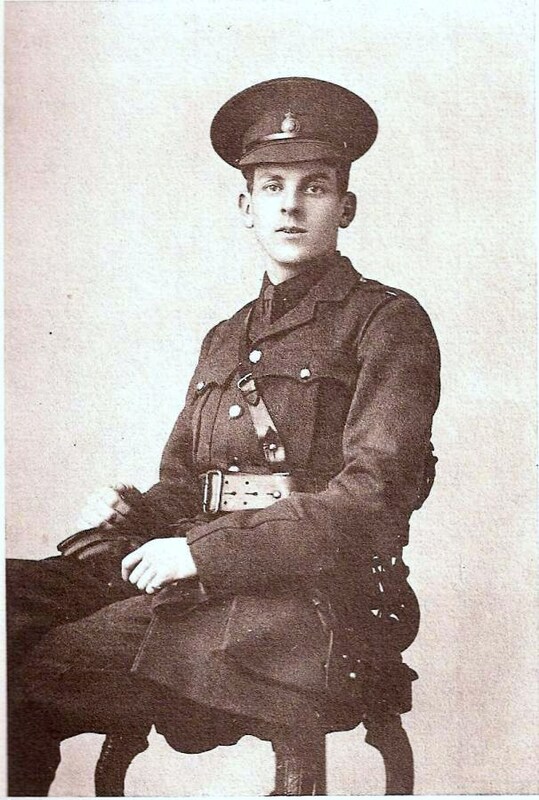 War interrupted his farming activities and, on 11 September 1914, he enlisted as Private 5683 in the 20th (Service) Battalion Royal Fusiliers, also known as the 3rd Public Schools Battalion. The public schools battalions, as the name suggests, attracted recruits who had attended public schools many of whom were prime officer material. Gerald was soon selected as a prospective leader and on 10 November he was discharged from the Royal Fusiliers in order to go for officer training. He entered Sandhurst Military College on 21 November and just under 4 months later, on 17 March 1915 he was commissioned as a 2nd Lieutenant in the Wiltshire Regiment. His medical report from his original enlistment shows that he was 5ft 6 ½ ins tall, weighed 9st 1lb, had a fair complexion, blues eyes and fair hair. Whereas his medical on entering Sandhurst measured him as an inch taller and 8lbs lighter – a couple of months in the ranks had certainly changed him. He was soon sent to France where he landed on 8 April almost certainly joining up with the 2nd Battalion Wiltshire Regiment (21st Brigade, 7th Division) at their billets at La Gorgue before they left for another stint in the lines on 14 April. He was probably on parade when the battalion was inspected by Field Marshall Sir John French on 13 April – not many subalterns got to see the Commander in Chief during their first week in France. Gerald was placed in C Company where he would, in theory, have commanded a Section – 15 men or so – responsible to a platoon Lieutenant. However, in war, such might change in minutes – it was not unknown for 2nd Lieutenants to find themselves in command of a battalion for short periods, until a more senior officer could be found. 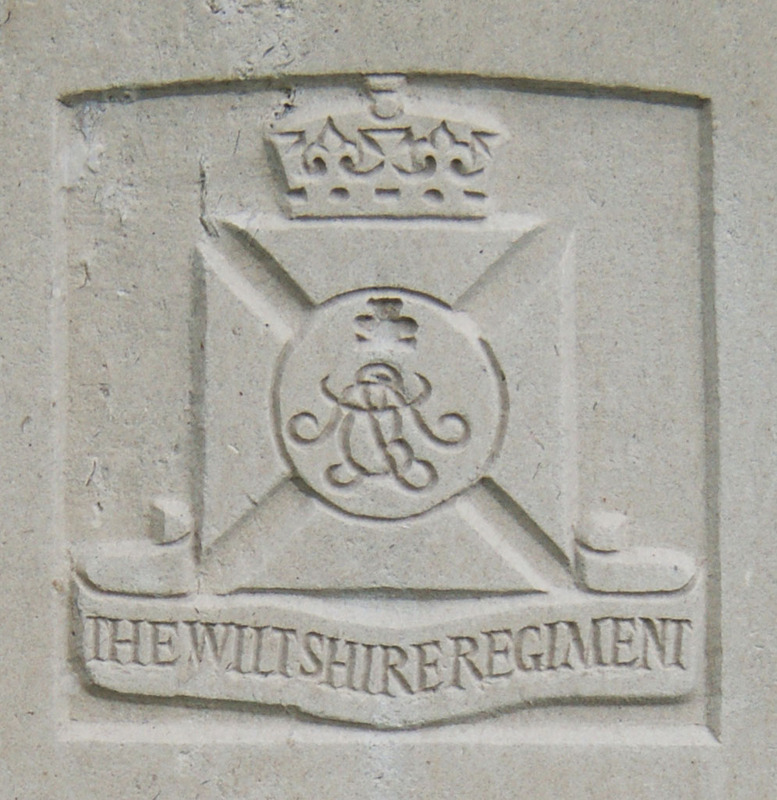 The regimental badge of the Wiltshire Regiment, as used on CWGC headstones. The Battle of Festubert officially ended on 25 May by which day the 2nd Wiltshires were back in safe billets, resting, reorganising, receiving reinforcements, etc. Gerald is listed as one of only four officers (all 2nd Lieutenants) in C Coy – meaning he was in command of a platoon during of the battle. On 27 May the entire 7th Division was inspected by General Joffre, commander of the French forces. On June 4th the battalion was inspected again, this time by British Prime Minister Herbert Asquith and General Sir Douglas Haig (then commanding 1st Army). In his short period with the battalion Gerald had certainly been seen by the top men! By 13 June the battalion was back up to full strength (35 officers and 1,000 men) and, on the following day went back into the trenches at Givenchy. The trenches had proved to be a very difficult line to hold, being subject to constant mining, sniping and trench mortar activity. So it was decided that an attack would be made in order to improve matters. The 21st Brigade was selected to lead the attack and the 2nd Wiltshires were selected as one of two battalions in the first wave. During the day trench J7 - I5 was shelled and the defenders (2 platoons of each 'C' & 'D' Coys ) suffered a few casualties. At 6pm the battalion commenced to attack the line I12, J14 -J13. On quitting their trenches, the leading companies ('C' & 'D') were subjected to a heavy frontal and enfilade fire, the latter from I4 - I9. As the advance progressed it was enfiladed by machine gun fire from both flanks, on the right from the foot of the hill between I12 & I3, on the left from machine guns concealed in the grass somewhere west of J13 'B' coy followed in support of 'C' & 'D' and occupied J9 -I5. 'A' coy in reserve in Scottish trench. 'A' Company had been kept in reserve intact, as it had orders to make a reconnaissance after the position had been captured, the reconnaissance to be on VIOLAINES. The firing line reached a point about 50 yards west of German trench at J14. There was then only one officer not hit in the two leading companies. At 7.5pm half 'A' company went forward to endeavour to push on the attack which had been held up. This half company with half 'D' company then advanced, and were subjected to enfilade fire from the crater, and could not advance beyond the disused Old German trench. At 9pm the situation was as follows:- The regiment was occupying the old German trench, with 'C' & 'D' Coys in front of them, and the trench J7 - I5, and were in touch with the Grenadier Guards on left of J7. Groups from 'C' & 'D' companies were returning to old German trench from the front. 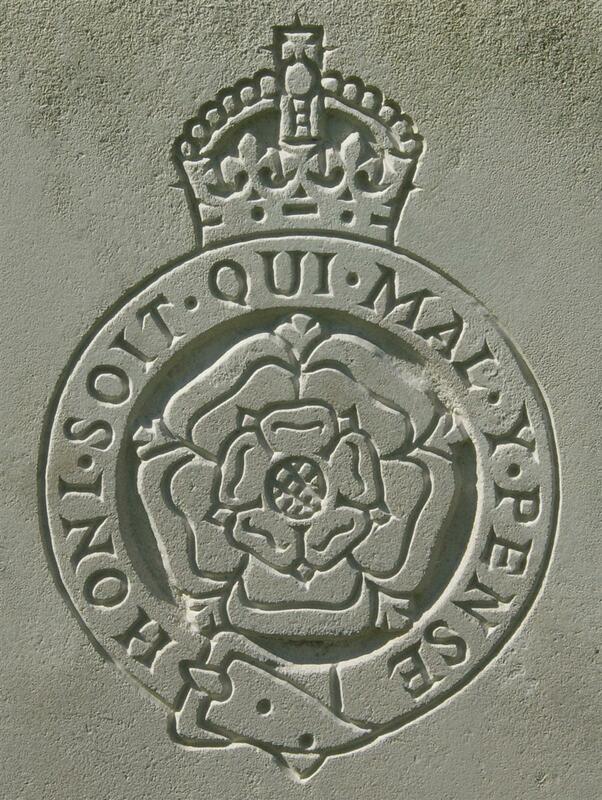 Orders were received to attack the German line at 9.15pm in conjunction with the Bedford Regt & Yorkshire Regt. The time was subsequently altered to 10pm. In order to form up for the attack the companies which were holding the old German trench & were being enfiladed from the right were ordered back to Scottish trench with orders to form up in rear of it to clear the field of fire of the company holding J7 - I5. The order to attack was subsequently cancelled as far as the Regiment was concerned, and instructions were received to hand over the trenches to the Bedford Regt and return to WINDY CORNER. During the action of 15th 16th, the Germans used incendiary bullets, and also sniped the wounded in front of their trenches. As can be seen C Company was in the thick of the action and, in the entry for the following day, Gerald was recorded among the list of officers killed. In total the battalion suffered 209 casualties that day, C Company alone losing all of its officers and 100 men. After the war a committee was set up to name and define the various battles along the Western Front – they decided that this action was not worthy of ‘battle’ status so it is known to history as the 2nd Action of Givenchy. In his account on the Long Long Trail website Chris Baker subtitles a section covering the events of 15 June as ‘A complete and costly failure’ – a sad but accurate summary of the whole action, which was abandoned after a second depressingly similar day. Gerald's name on Newbury War Memorial. Gerald’s body was not recovered at the time and was not identified when the battlefields were cleared up after the war, so he has no known grave. Instead his name is remembered on panel 33 of the Le Touret memorial to the missing from this sector of the front. Locally he is remembered on tablet 4 of the Newbury Town War Memorial. 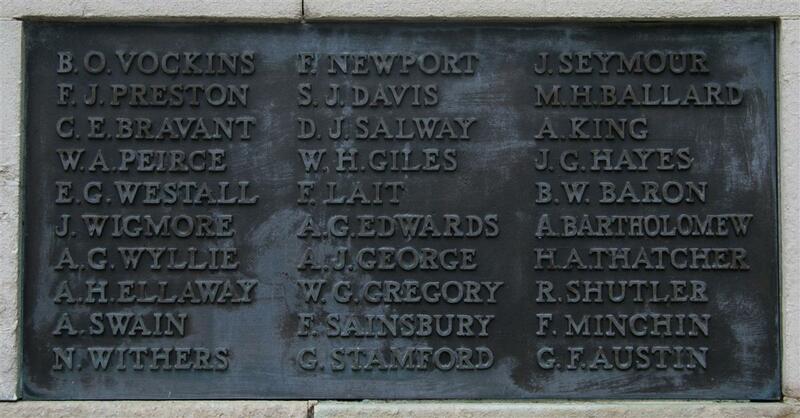 He is also remembered on the Lancing College war memorial. A faculty has been granted to place a brass tablet in St John the Evangelist’s Church, Newbury, to the memory of the late Lieut G M Stamford, the son of Mrs Stamford of Catherine Road, Newbury. St John’s Church was destroyed by a German bomb on 10 February 1943.